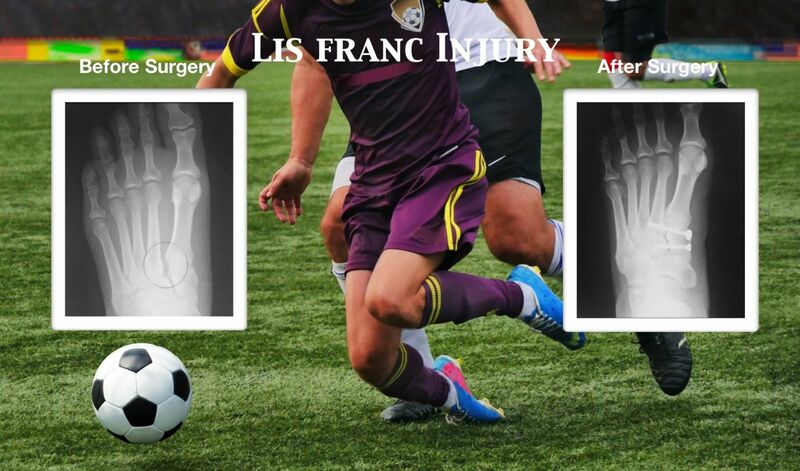 Lisfranc's injuries are challenging injuries that cause disruption to the ligaments in the middle portion of the foot. They are more common in sports activities such as football. When the foot is pointed down and something lands on the back of the heel the midfoot area collapses. 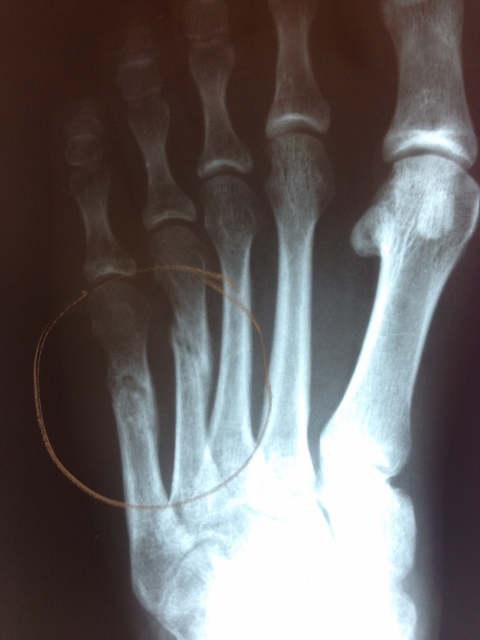 This causes a disruption of the ligaments in the midfoot and often the bones around them. These injuries can also occur from something as simple as falling forward while wearing a shoe with a heel. Coming off of a step and falling forward can also cause injuries to the midfoot region. 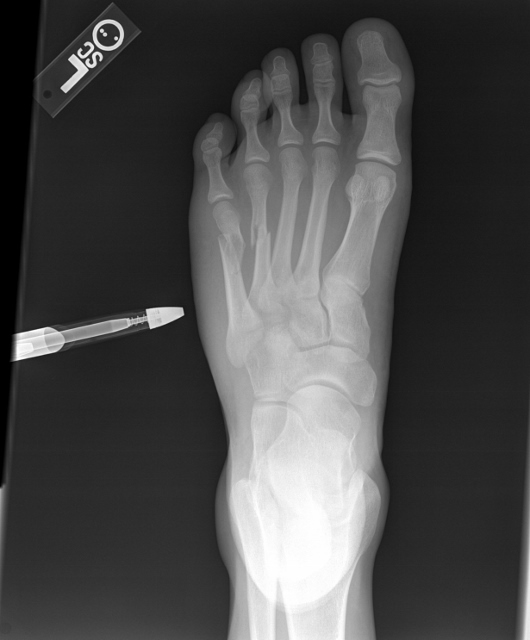 A disruption of the ligaments in the midfoot is rare with direct trauma to the area. 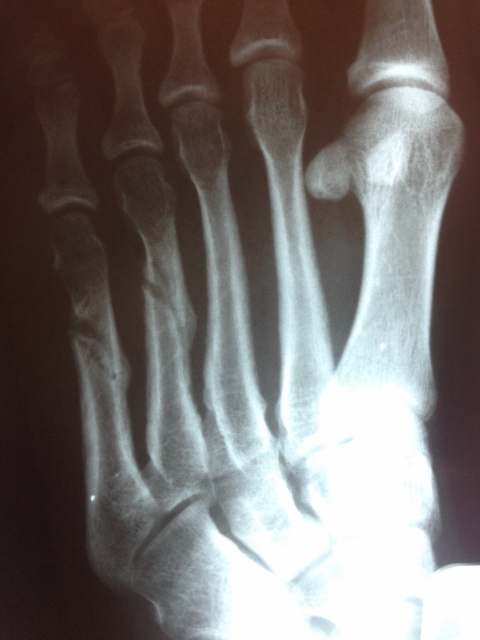 Direct trauma often causes a fracture to the bones in the midfoot region. 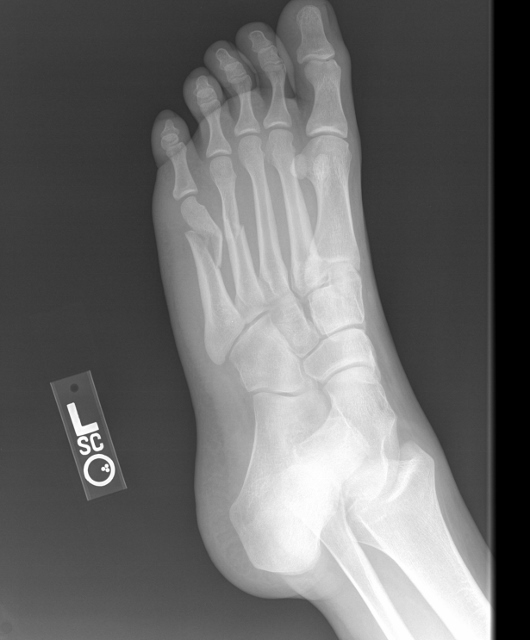 Lisfranc's injuries cause an immediate swelling and pain throughout the midfoot area both on the top and bottom of the foot. It is often accompanied by a black and blue area on the bottom of the foot, which usually accompanies more traumatic events. Patients often experience diffuse swelling and difficulty weightbearing. These injuries need to be evaluated and addressed immediately. 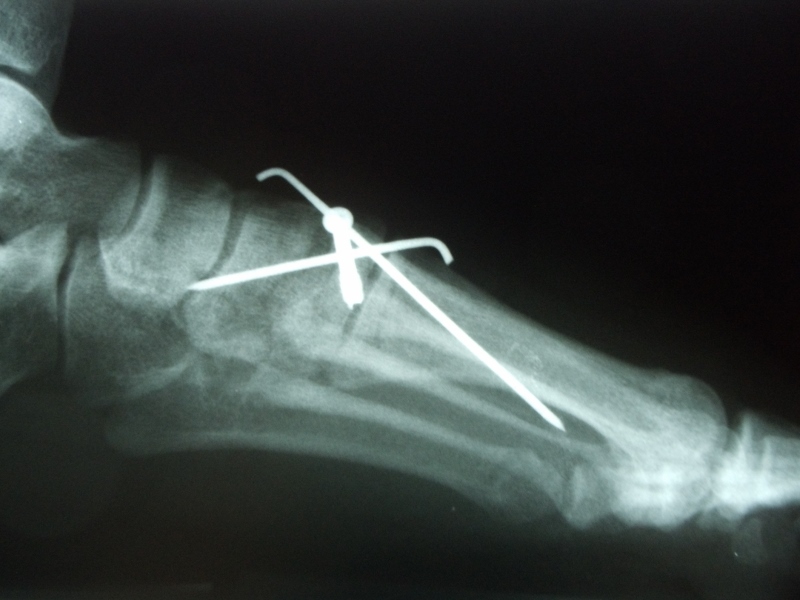 Acute treatment of Lisfranc's injuries is to fully evaluate the extent of the injury. When the bones have separated most often open reduction and internal fixation is performed. 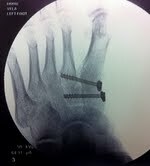 This will allow the bone to be put back to its proper anatomical position and allow healing of the ligaments. Most commonly we place the patient twelve weeks nonweightbearing. 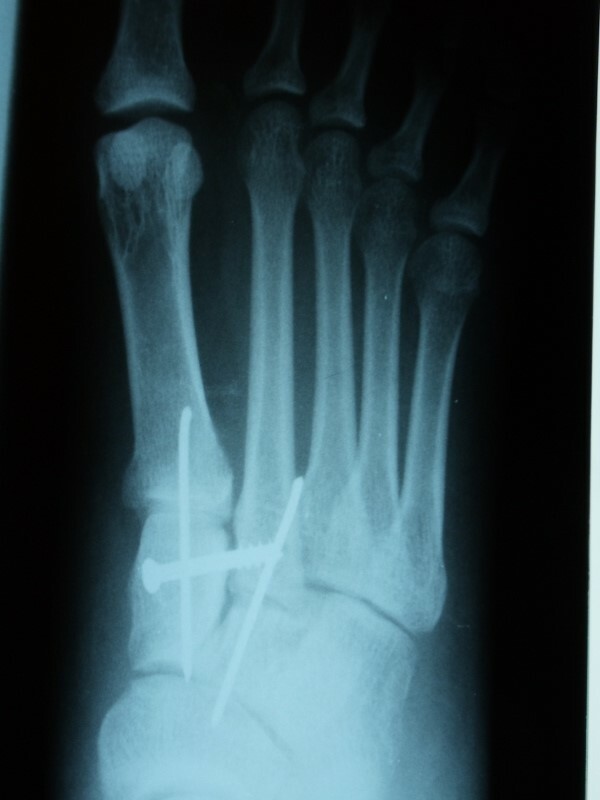 We avoid putting screws across the joints, which is commonly performed to avoid injuries to the joint surface. Small K-wires are more than enough to hold the position of the joints during the healing process. 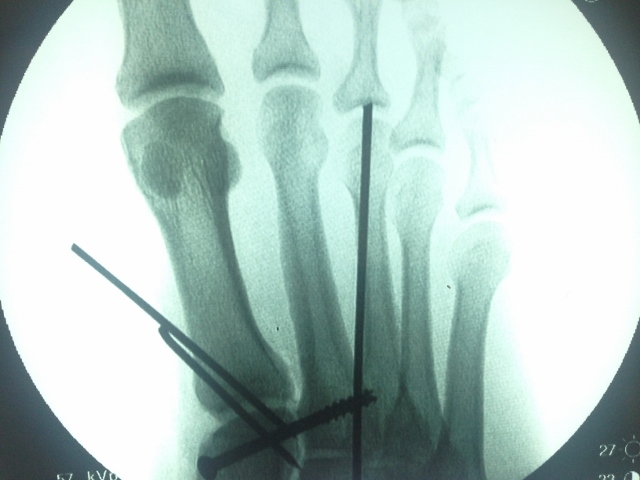 Any pins that are placed across the joint surfaces are removed at approximately twelve weeks. 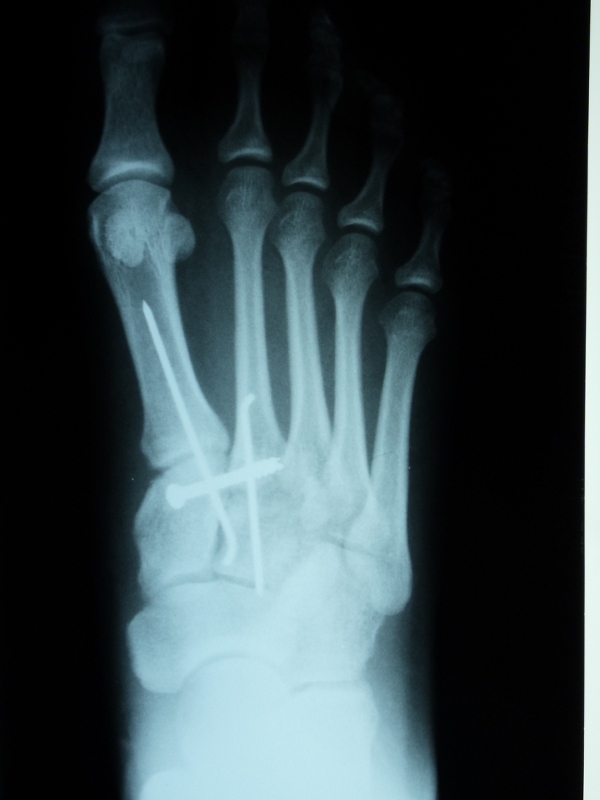 The main screw going from the inside of the cuneiform to the second metatarsal would stabilize the Lisfranc's ligament will often remain. This may add further stability to the midfoot. Screws may have a tendency to loosen over time or even break. This provides no long-term problems. 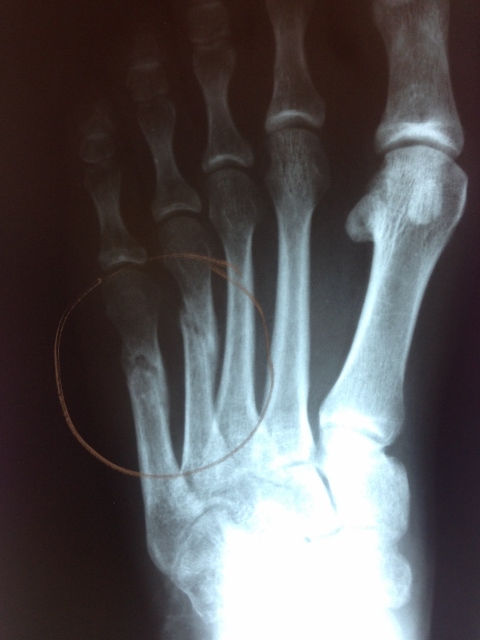 Lisfranc's injuries are often associated with arthritis at some point in the future despite the most perfect anatomic reduction. Sometimes the arthritis is very subtle and can be treated with anti-inflammatories and an orthotic placed in a person’s shoe. 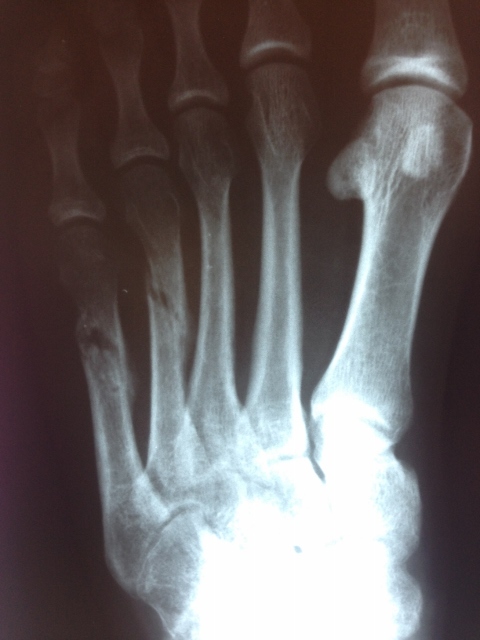 If the problems persisted, then fusing one or two of the small joints in the midfoot may provide complete relief of all symptoms and a full return to all activity. 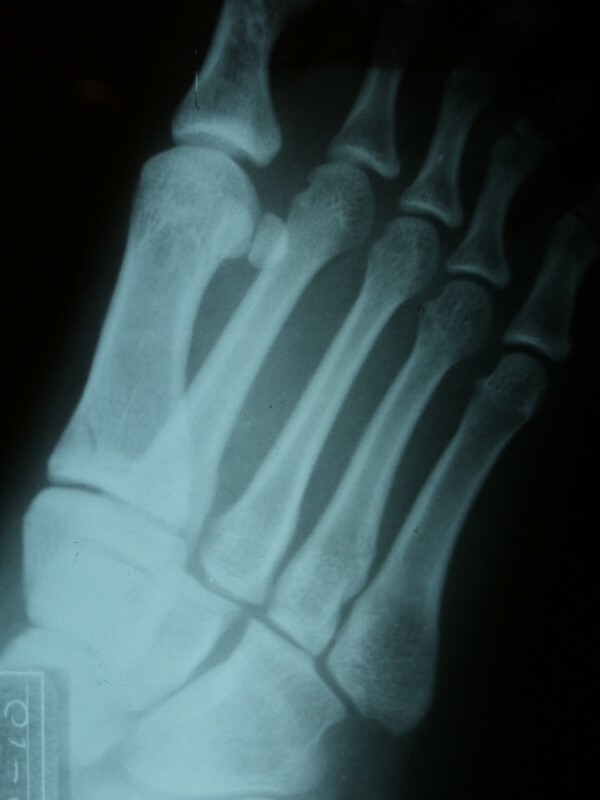 This is an example of an injury to the arch of the foot involving the Lisfranc's ligament between the base of the second metatarsal and the medial cuneiform bone. This is a very important stabilizing ligament of the foot (left). 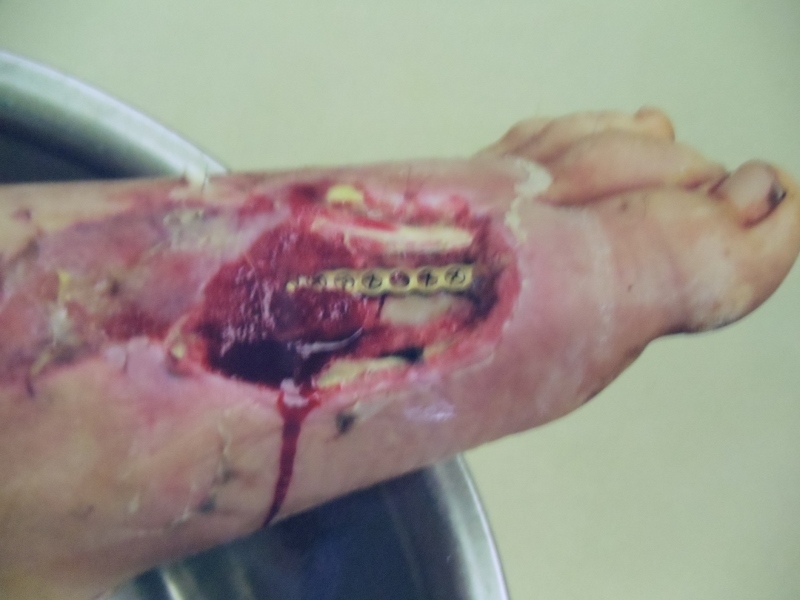 This injury is repaired surgically with screws, pins and occasionally surgical plates. This case was corrected with a combination of screw and pins (right). 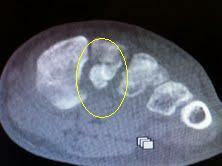 Below is an MRI image demonstrating the location of the Lisfranc's ligament with the ligament ruptured (red arrow). The images below demonstrate Lisfranc's ligament rupture with increased spacing between the medial cuneiform and the intermediate cuneiform. 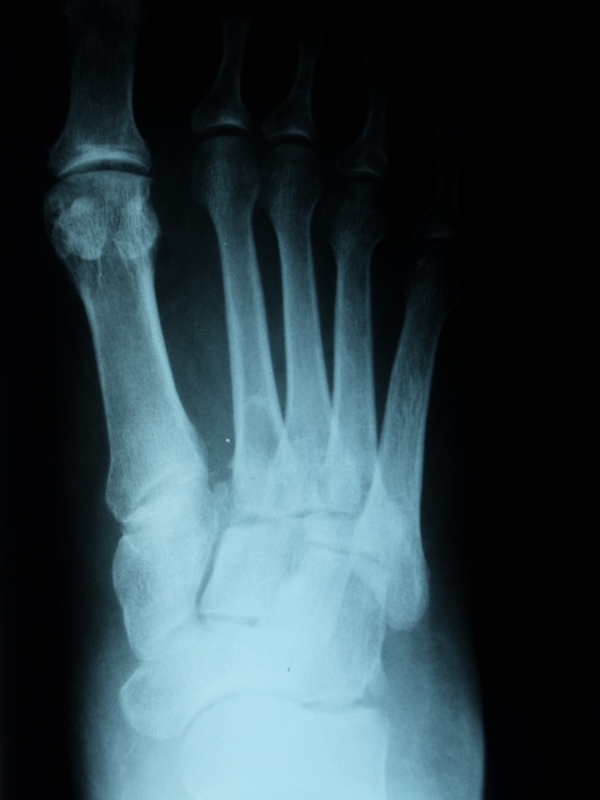 The ligament is attached between the base of the second metatarsal and the lateral aspect of the medial cuneiform (left). 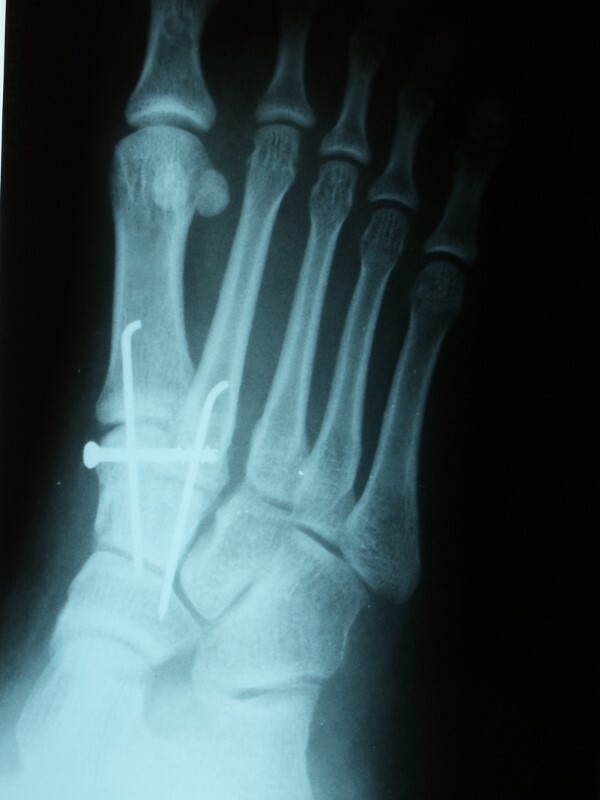 The post-surgical repair with screw fixation (right) shows reduction in that aforementioned space between the cuneiforms, re-establishing the stability of the medial midfoot. 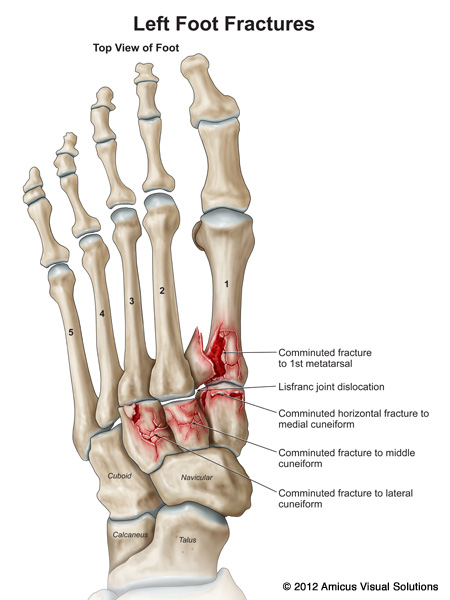 The Lisfranc, or tarsometatarsal joint forms a bony arc across the midfoot. The diagnosis has been missed in up to 20% of cases. The mechanism of injury is often a misstep or fall with forced plantarflexion of the forefoot on the rearfoot. Diffuse swelling across the midfoot is noted with ecchymosis, or bruising, noted in the arch. 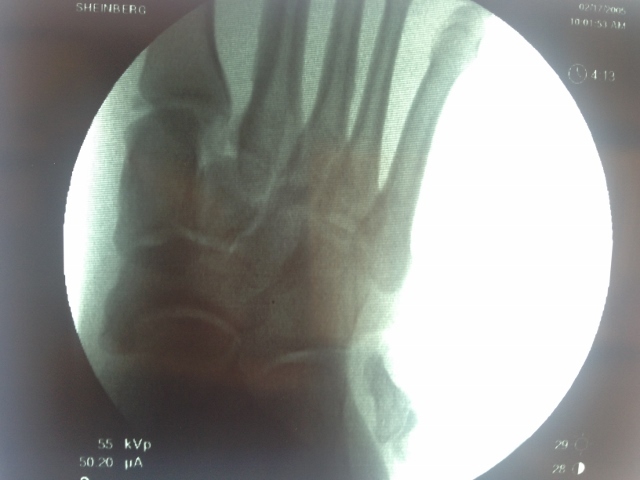 X-ray of both feet can aid in subtle radiographic changes in the injured foot. 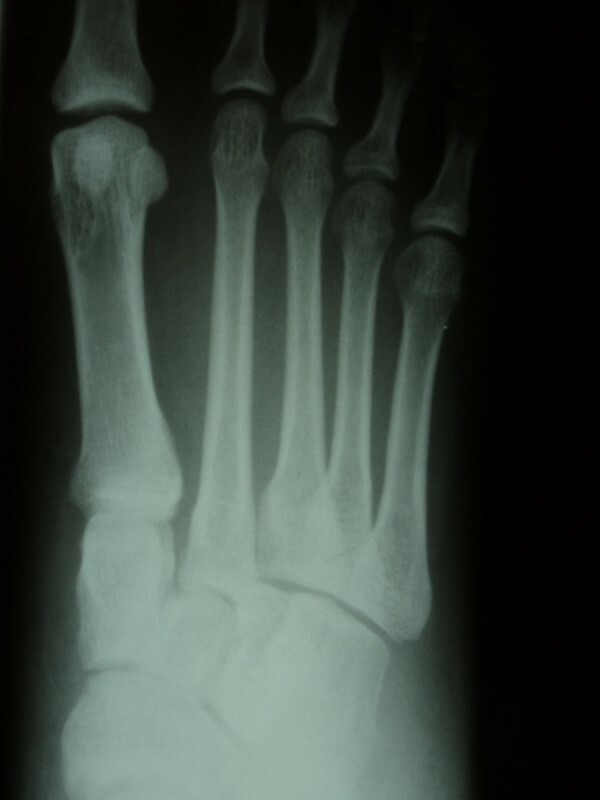 If there is no displacement on X-ray noted but sprain is considered, an MRI without contrast of the foot will evaluate the integrity of the Lisfranc's or medial cuneiform- second metatarsal ligament. 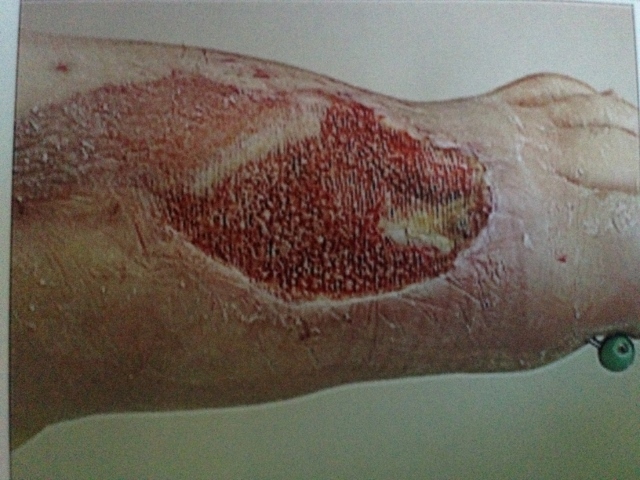 If intact and no displacement or fractures are noted, nonweightbearing cast immobilization is standard treatment for approximately 6 weeks. If displacement or complete tear occurs, surgical reduction and fixation is recommended to stabilize and reduce the fracture. CT scans are utilized for evaluation for better visualization of osseus structures. Accurate anatomic reduction, whether open or closed, provides better functional results. 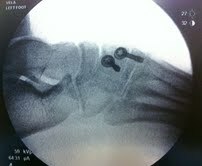 Percutaneous wire or screw fixation to maintain alignment and congruity. If neglected, these injuries can cause chronic pain and necessitate fusion to prevent pain. 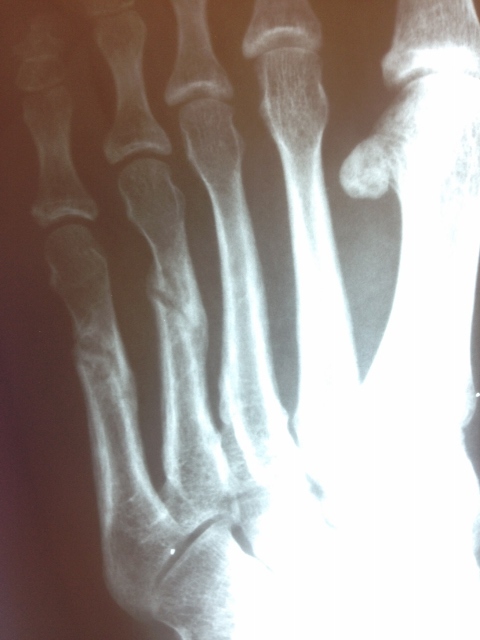 Below is a case of a Lis Franc's injury secondary to avulsion fracture of the insertion of the ligament into the second metarsal. 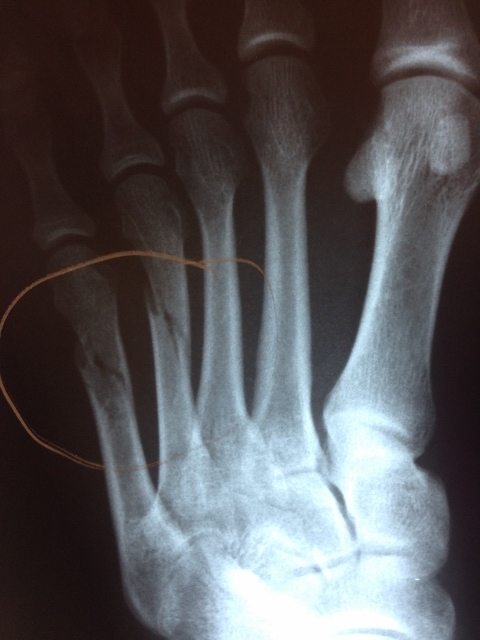 The original injury cannot be seen on x-ray but measurable gap in the articulation where the ligament is located is seen at 3mm on the left and 1mm on the right. 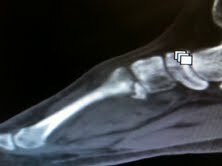 Advanced imaging with CT scanning demonstrated the fracture at the plantar base of the 2nd metatarsal allowing the gapping of the joint. 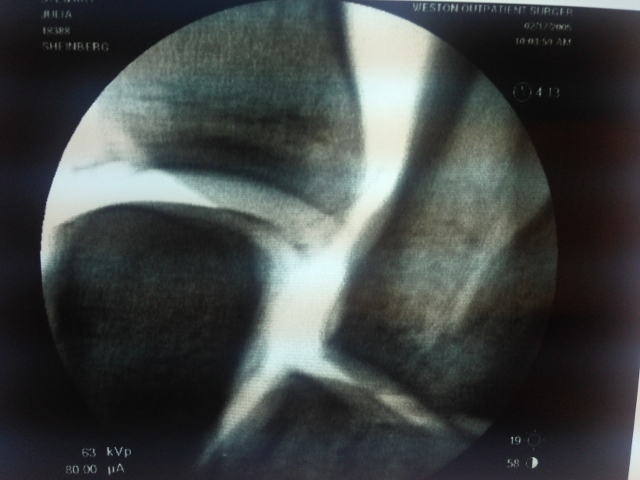 This area remains unstable and painful for the patient necessitating surgical repair for stabilzation and proper healing of the area which is accomplished in this case with surgical screws to reduce the joint dislocation.